Unless you’re an astrophysicist, you probably don’t sit around thinking about dark energy all that often. That’s understandable, as dark energy doesn’t really affect anyone’s life. But when you stop to ponder dark energy, it’s really rather remarkable. This mysterious force, which makes up the bulk of the Universe but was only discovered 17 years ago, somehow is blasting the vast cosmos apart at ever-increasing rates. Astrophysicists do sit around and think about dark energy a lot. And they’re desperate for more information about it as, right now, they have essentially two data points. One shows the Universe in its infancy, at 380,000 years old, thanks to observations of the cosmic microwave background radiation. And by pointing their telescopes into the sky and looking about, they can measure the present expansion rate of the Universe. But astronomers would desperately like to know what happened in between the Big Bang and now. Is dark energy constant, or is it accelerating? Or, more crazily still, might it be about to undergo some kind of phase change and turn everything into ice, as ice-nine did in Kurt Vonnegut’s novel Cat’s Cradle? Probably not, but really, no one knows. Fortunately astronomers in West Texas have a $42 million plan to use the world’s fourth largest optical telescope to get some answers. Until now, the 9-meter Hobby-Eberly telescope at McDonald Observatory has excelled at observing very distant objects, but this has necessitated a narrow field of view. However, with a clever new optical system, astronomers have expanded the telescope’s field of view by a factor of 120, to nearly the size of a full Moon. The next step is to build a suite of spectrographs and, using 34,000 optical fibers, wire them into the focal plane of the telescope. With this detailed information about the location and age of objects in the sky, astronomers hope to gain an understanding of how dark energy affected the expansion rate of the Universe 5 billion to 10 billion years ago. There are many theories about what dark energy might be and how the expansion rate has changed over time. Those theories make predictions that can now be tested with actual data. In Texas, there’s a fierce sporting rivalry between the Longhorns in Austin and Texas A&M Aggies in College Station. But in the field of astronomy and astrophysics the two universities have worked closely together. And perhaps no one is more excited than A&M’s Nick Suntzeff about the new data that will come down over the next four years from the Hobby-Eberly telescope. Suntzeff is most well known for co-founding the High-Z Supernova Search Team along with Brian Schmidt, one of two research groups that discovered dark energy in 1998. This startling observation that the expansion rate of the Universe was in fact accelerating upended physicists’ understanding of the cosmos. They continue to grapple with understanding the mysterious force—hence the enigmatic appellation dark energy—that could be causing this acceleration. When scientists observe quantum mechanics, they see tiny energy fluctuations. They think these same fluctuations occurred at the very dawn of the Universe, Suntzeff explained to Ars. And as the early Universe expanded, so did these fluctuations. Then, at about 1 second, when the temperature of the Universe was about 10 billion degrees Kelvin, these fluctuations were essentially imprinted onto dark matter. From then on, this dark matter (whatever it actually is) responded only to the force of gravity. Meanwhile, normal matter and light were also filling the Universe, and they were more strongly affected by electromagnetism than gravity. As the Universe expanded, this light and matter rippled outward at the speed of sound. Then, at 380,000 years, Suntzeff said these sound waves “froze,” leaving the cosmic microwave background. These ripples, frozen with respect to one another, expanded outward as the Universe likewise grew. They can still be faintly seen today—many galaxies are spaced apart by about 500 million light years, the size of the largest ripples. But what happened between this freezing long ago, and what astronomers see today, is a mystery. The Texas experiment will allow astronomers to fill in some of that gap. They should be able to tease apart the two forces acting upon the expansion of the Universe. There’s the gravitational clumping, due to dark matter, which is holding back expansion. Then there’s the acceleration due to dark energy. Because the Universe’s expansion rate is now accelerating, dark energy appears to be dominating now. But is it constant? And when did it overtake dark matter’s gravitational pull? 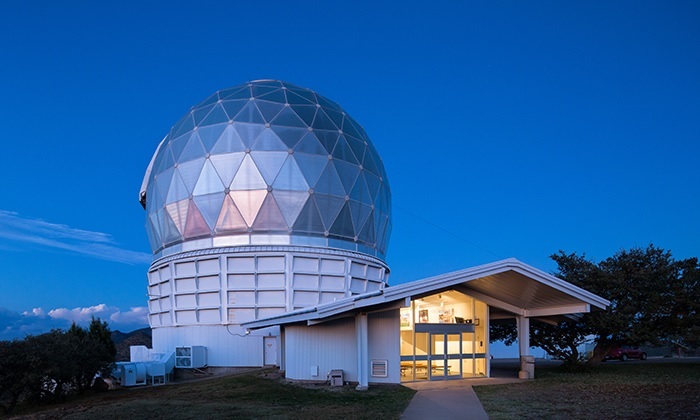 Funding for the $42 million experiment at McDonald Observatory, called HETDEX for Hobby-Eberly Telescope Dark Energy Experiment, will come from three different sources: one-third from the state of Texas, one-third from the federal government, and a third from private foundations. 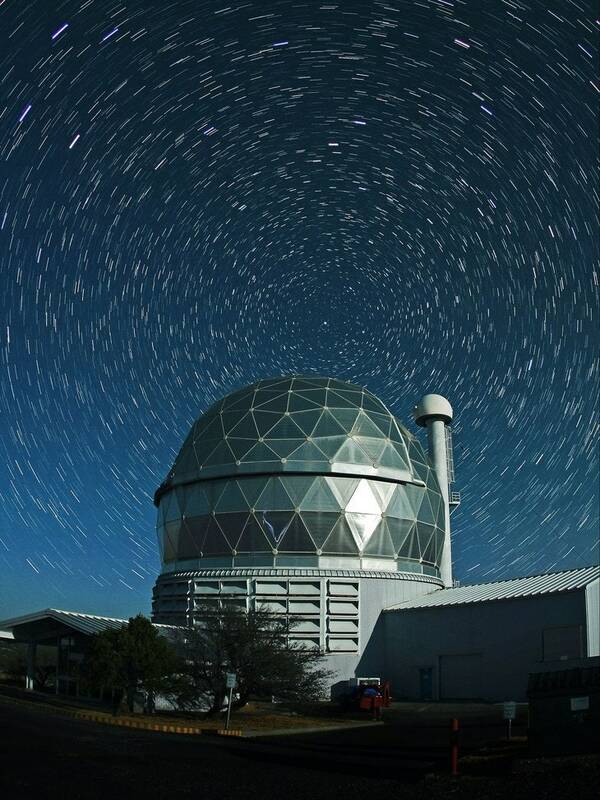 The telescope is in the Davis Mountains of West Texas, which provide some of the darkest and clearest skies in the continental United States. The upgraded version took its first image on July 29. Completing the experiment will take three or four years, but astronomers expect to have a pretty good idea about their findings within the first year. If dark energy is constant, then our Universe has a dark, lonely future, as most of what we can now observe will eventually disappear over the horizon at speeds faster than that of light. But if dark energy changes over time, then it is hard to know what will happen, Suntzeff said. One unlikely scenario—among many, he said—is a phase transition. Dark energy might go through some kind of catalytic change that would propagate through the Universe. Then it might be game over, which would be a nice thing to know about in advance. After several years and a massive team effort, one of the world’s largest telescopes has opened its giant eye again. 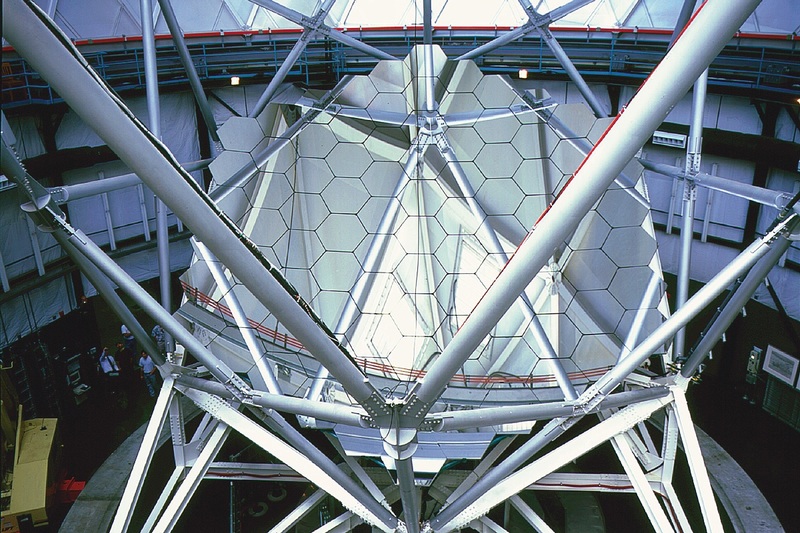 The Hobby–Eberly 9.1 meter Telescope (HET) at The McDonald Observatory has completed a $25 million upgrade and, now using more of its primary mirror, has achieved “first light” as the world’s third-largest optical telescope.